Perhaps the best way to introduce Nikon's full-frame D800 DSLR is to note that it is not at all the camera Nikon enthusiasts were expecting. In hindsight, there is a certain logic to the D800's massive, 36-megapixel sensor—it delivers very nearly the same pixel density as Nikon's DX-sensor D7000, only spread across a much larger FX sensor. Still: 36 megapixels! What on Earth are we supposed to do with so much resolution? 36 megapixels pushes the D800 firmly toward the realm of medium-format digital photography. There are advantages to such keen resolution, to be sure, but there are significant liabilities as well. Physically, the D800 is big and it is heavy. To make good use of its incredible resolution, you'll need fabulous lenses and professional technique. And in the end, though it's nice in a theoretical way to have so many pixels at your disposal, most D800 photographers will likely find their hard drives stuffed with giant NEF files that collectively form a massive, disk-choking monument to overkill. In terms of handling, I don't think the D800 is Nikon's best body (the D300, D7000, and even D600 are better), but you'll adapt to it. The most demanding photographers may find the D800's continuous maximum of "up to" 4 frames per second too slow, and the D800's high-ISO performance a bit too noisy. Both limitations, of course, are a direct result of the camera's giant pixel count. Nevertheless, it would be silly for me to argue the D800 is anything other than a formidable imaging machine. Used properly, the D800 is likely to get as fine an image as you can currently shoot with a DSLR. That said, unless I'm planning to shoot landscapes on a tripod, I'm almost always finding myself reaching for another camera. Let's talk video. Believe it or not, Nikon pioneered DSLR video with the old D90. Canon and Sony quickly followed with their own, superior offerings, and Nikon has been playing catch-up ever since. 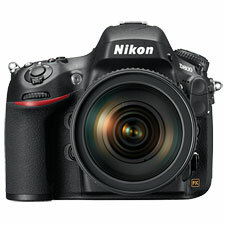 The D800 is the first Nikon body to clearly out-resolve its competitors (as of November 2012, at least). But there's a catch—actually, a bunch of them. First, let me emphasize that the D800 is a stellar performer when it comes to shooting natural subjects—and particularly natural subjects (ie, faces) isolated against blurred backgrounds. There is no usable autofocus, so any shallow depth-of-field videography will involve careful focus pulling if anything is moving. Still: with any high-end lens, you'll get stunning shots. The D800 is also a video monster when it comes to deep-focus natural landscapes. Again, use a great lens, preferably prime, and the D800 will reward you with vibrant, crackling-sharp, three-dimensional shots that even seem—I swear—to have a tiny dash of film grain to them. I don't think there is currently a camera within thousands of dollars of this price range capable of besting it. And now, the liabilities. D800 video is highly vulnerable to color moire and aliasing. These will appear in direct proportion to the amount of man-made or regularly-patterned objects found within the scene. Start shooting wide-angle interior or urban scenes, and you will find the D800 yields highly erratic results—sometimes clean, sometimes, in all honesty, a mess. Over time, you'll learn to anticipate and work around scenes that trigger the worst of the D800's video aliasing problems. But you'll always wish they weren't there in the first place. And, if you're wondering, Canon and Sony's best do a much better job, across the board, when it comes to handling these same issues. So, in summary, the D800's excellent video resolution is a bit illusory. When it comes to critical software features like peaking (which aids focus) and zebras (which aid exposure), the D800 and Nikon lag Canon and, dramatically so, Sony. These are not trivial omissions, especially if your interest in video goes beyond mere hobby toward more professional applications. So, on the whole, with regard to video the D800 offers a very mixed bag. Taking video off the table, the bottom line is the D800 is an incredible photographic tool, overkill or not, and for the vast majority of still photography applications, it is more than capable of delivering state-of-the-art results. On the other hand, for video-centric DSLR photographers, I think the D800 is best thought of as an intermediary. If you've got to have a video-capable Nikon, this is the best we've seen to date. But D800 video is obviously limited by technical issues (aliasing/moire), and feature omissions (peaking!). A year from now, maybe even less, I bet there will be other cameras that completely render D800 video obsolete. At $2999 list, it might be worth it to wait.